The vendor landscape of the global cyber security as a service market is becoming increasingly crowded and competitive, observes Transparency Market Research in a recent report. Rapid adoption of cyber security as a service across the world has led helped many companies to innovate and develop cyber security solutions and services. Owing to the increased demand, a large number of start-ups have emerged in the cyber security market in order to establish significant presence in the market. Some of the leading companies in the global cyber security as a service market are AT&T, Armor Defense Inc., BlackStratus, Capgemini, Choice CyberSecurity, Transputec Ltd, Cloudlock (Cisco), BAE Systems, FireEye, Inc., Optiv Security Inc., LookingGlass Cyber Solutions, Inc., and Tata Consultancy Services Limited. According to the report, the global cyber security as a service market is expected to reach US$87.59 bn in revenue by 2025, rising from US$ 30.91 Bn in 2016. The market is estimated to expand at an impressive CAGR of 12.5% from 2017 to 2025. Of the key cyber security services provided by the market, the segment of auditing and logging is expected to surge during the forecast period. Auditing and logging applications are used in the organizations to audit unauthorized access performed on internal systems or network and are witnessing an increased uptake across small- and medium-sized enterprises that are increasingly relied upon data saved on cloud networks. 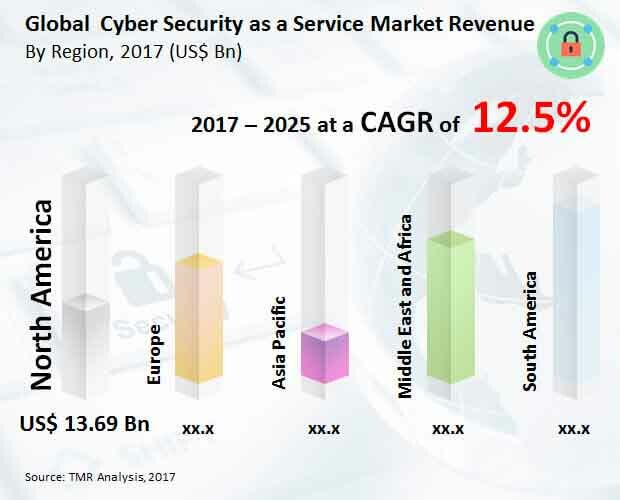 Geographically, the market in North America presently dominates the global cyber security as a service market accounting for the dominant share of revenue and is expected to dominate over the forecast period as well. Global cyber security as a service market is mainly driven by the increased adoption of cyber security as a service across small- and medium-sized enterprises. As majority of the cyber-attacks are targeted at small and medium companies due to limited awareness and investment for the cyber security solutions, enterprises are becoming increasingly mindful regarding the need to adopt effective security solutions. Further, security breaches are becoming more sophisticated and intruders are well funded to develop advanced evasion techniques to enter the small and medium enterprise network unnoticed. Using high level of expertise and special tools, cyber security service providers can support small and medium enterprises in threat detection and mitigation. Further, with the increasing adoption of cloud deployment across industries, concerns about cloud security are also increasing and organizations are spending on security solutions and services for the end-to-end security of their cloud data. Moreover, the rising number of devices connected to internet and a vast surge in adoption of trends such as bring your own device (BYOD) are anticipated to drive the cyber security as a service market. The number of smart devices that are connected to the internet is high and this number is expected to grow exponentially in the years to come, driving the increased need for effective cyber security measures in place.